This is the place for you to show off your DCYou flair and see how others are finding their place in the New DC Universe! Want to get in on this? 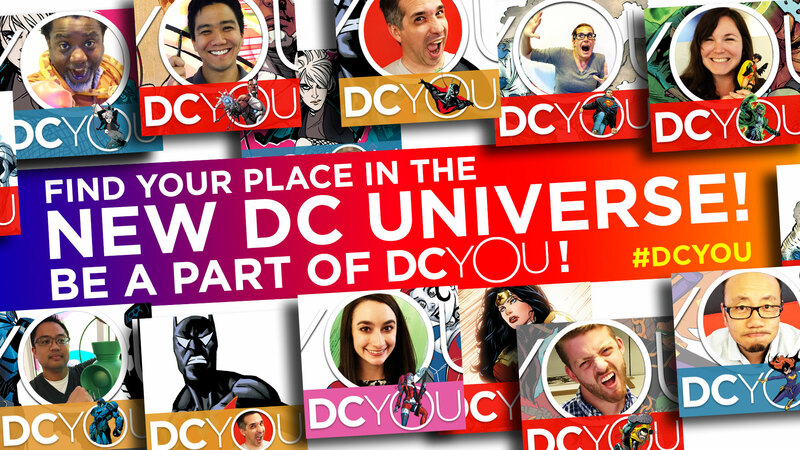 Download your DCYou image here and post to #DCYou! Are You Ready for Prez's Mark Russell? Are You Ready for We Are Robin's Lee Bermejo? Are You Ready for Superman's Gene Luen Yang? Are You Ready for Aquaman's Trevor McCarthy and Cullen Bunn? Are You Ready for Green Lantern: The Lost Army's Cullen Bunn? Are You Ready for Action Comics' Greg Pak and Aaron Kuder? Are You Ready for Grayson's Tom King, Tim Seeley and Mikel Janin? Are You Ready for Black Canary's Annie Wu? Are You Ready for Robin: Son of Batman's Patrick Gleason? Are You Ready for Harley Quinn's Jimmy Palmiotti, Amanda Conner and Chad Hardin? Are You Ready for Gotham Academy's Becky Cloonan, Brenden Fletcher and Karl Kerschl? Are You Ready for Batman's Scott Snyder? Are You Ready for Batman Beyond's Dan Jurgens and Bernard Chang? Are You Ready for Bizarro's Heath Corson? Are You Ready for Justice League's Geoff Johns and Jason Fabok? Are You Ready for Midnighter's Steve Orlando?